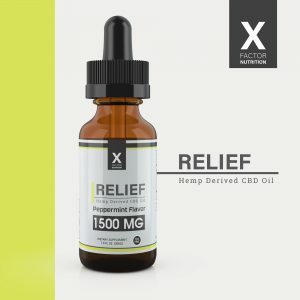 Why Relief vs Other CBD Products? Our hemp is all grown organically in Colorado. We use no chemicals, solvents or heat in any part of creating the product. We use CO2 extraction along with a non-chemical process to remove pathogens, molds, and heavy metals. X-Factor Nutrition customers are receiving the highest quality, purest, oil. Relief uses no chemicals or emulsifiers that are found in many CBD products today. Why Do People Take Relief? Optimal Brain and Nerve Function – CBD has been shown to have a calming and balancing effect and to promote neurogenesis in multiple regions of the brain. CBD is being used by students and busy executives because it has been known to promote mental focus and clarity. Restful Sleep – CBD has been known to promote deeper, healthier sleep, which impacts all areas of your well-being. Healthy Cell Function and Regeneration – CBD promotes strong healthy cells, by maintaining their regulation and homeostasis. Improved Athletic Performance – Athletes are taking CBD for its ability to decrease recovery times, enhance stamina, and reduce aches and discomfort. These are just a few of the many benefits people like you are seeing from enjoying Relief. All Relief products are sent to 3rd party labs for testing and analysis. We provide a Certificate of Analysis on every single batch of products we produce. You can be confident in the purity, authenticity, and potency of Relief. Will Relief Make Me High? The cannabinoid that makes someone “high” is called THC and is found in Marijuana. 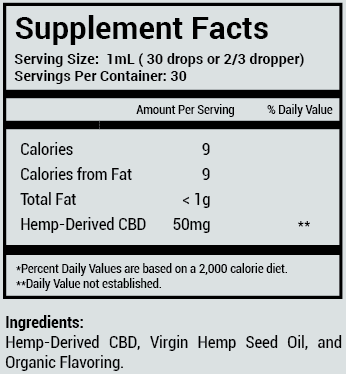 Relief CBD Oil is derived from Hemp and is certified by a 3rd party to be 100% THC Free. I have a hard time falling asleep, even when I’m dog tired. My mind races with all the things from day or on my to do list. Within the first few days of taking Relief, i began falling asleep fast! Within minutes. And i wake up feeling rested. I’m on my 4th week and I’m starting to see other benefits as well. I take it twice a day and I’m calmer and less irritated. I started taking the relief at Breakthrough. I have severe back and sciatica pain along with falling asleep. Since I have been taking it I’m sleeping so much better and my back and sciatica has subsided a little. I can get up in the mornings able to walk without having to stretch for about 10 mins to feel better in 30 minutes to go about my day. I take it twice a day and very pleased with the results and other benefits that I’ve noticed. I am noticing it helping me see clearer, sleeping better and reducing my hot flashes. Digestive system feels better too! I have Rheumatoid Arthritis, an autoimmune disease, which is a chronic inflammatory disorder that affects all my joints. It is extremely PAINFUL. 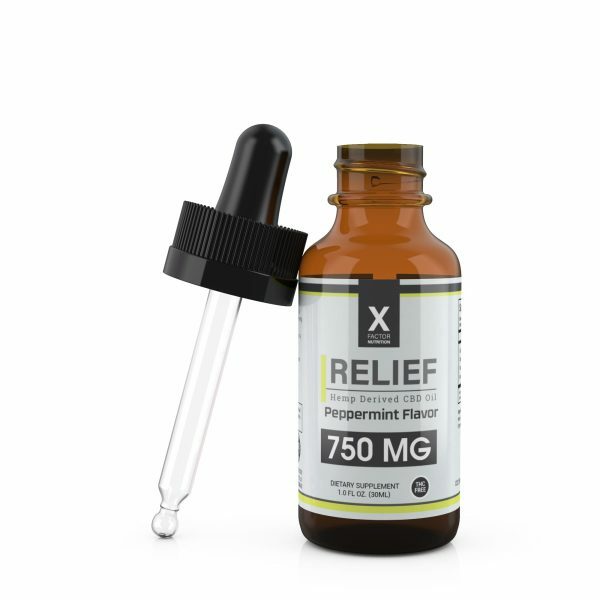 I am seeing relief by taking RELIEF CBD Oil. I am moving much easier and the inflammation and pain have diminished greatly AND helps me sleep better. Sleeping is awesome with Relief! I had 5 surgeries in 2017, both ankle breaks, both rotator cuff repairs. From the ankle surgeries I was non weigh bearing for 14 weeks and suffer from total atrophy in my thighs and hamstrings. It’s put a tremendous strain in my knees, stairs have been impossible up or down. Since taking Relief the pain is gone, I’m beginning to do squats, couldn’t before and I don’t wake up with the aches and pain I used to. Relief is the ONLY thing I’ve changed. I’m a total believer in Relief! For years I’ve had to take medication to fall asleep and stay asleep. Since starting Relief, I have completely stopped taking the medication and have felt like the rest I’m getting is even better than before as I sleep throughout the night and fall asleep without my mind racing 100 miles a minute. I have had anxiety issues for years. After taking Relief, I am more calm and can focus. I no longer take prescription pills for that issue. I also had migraines prior to relief since age 12 and was a guinea pig for the doctors on which medication works best. Since Relief, no more pills and migraines have decreased significantly . I deal with RA so I spend a lot of time sore. Started taking my CBD Oil at Breakthrough and haven’t taken my RA meds since. I can tell when I need to do more than 1dropperful so I occasionally do two droppersful. I’ve better and sleep better. No more Tylenol Arthritis for pain!!! I have been on RELIEF CBD Oil since October 2018, and I have been able to remove all arthritic pain medications which were taken to relieve degenerative arthritis symptoms as a result of a post cervical fusion and rotator cuff repair a few years ago. I am able to sleep better, move more freely and feel rested and energized each day. As a nurse of over 30 years, I am loving RELIEF CBD Oil as a product that can holistically work without the side effects! Gail Alexander, January 22, 2019. 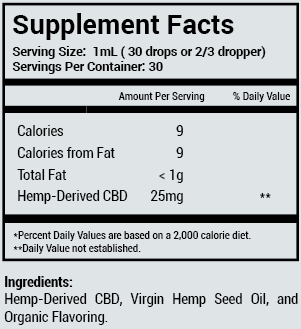 I was introduced to CBD relief oil on November 2, 2018. Since then I have had restful nights. In addition, I have no muscle pain or aches prior to my work outs. Oh, yes a pleasant peppermint taste. Try it! I typically think of myself as a pretty healthy person and do not normally take any form of supplements. I decided to try Relief to see if I noticed any differences. I took it for just over 2 weeks and thought nothing change for me. What I did not pay attention to was that I was sleeping better through the nights, waking up more relaxed, being more focused on work, being more motivated to get work done, and my leg pain during the nights were basically gone. It took one night of not taking Relief for me to recognize all these benefits. The one night I didn’t take Relief was the one night I realized all of the benefits. Since then, I have been religiously taking Relief everyday and feel great! What did we do before we found Relief? All I recall was how I woke up extremely groggy and tired, never felt rested. Since taking relief I sleep more soundly and when I wake up I feel so well rested. I’m sure it’s due to the great night of sleep that i’m getting but my mental clarity is the best it’s been in years! I take Relief twice a day and also now use it as a ache/pain substitute. If I get a headache I just take some relief and it goes right away. I would almost call this stuff Magical because I can’t imagine life without it! Helps with my anxiety and stress as a preschool teacher/ business owner.. Sleep is great mental clarity on point and less joint pain after workouts at the gym.. Great stuff now have my 92 yr young granny on it she loves it.. Awesome product!!! I suffer from inflammation and joint pain as well as skin eruptions due to Lupus. While I cannot make any medical claims, I can tell you that I no longer take pharmaceutical drugs and that I experienced a severe flare up and when I took Relief orally and applied topically, all my redness and my swelling subsided within 8 hours. Within 3 days it was completely gone! That’s the Power of X! I have experience anxiety issues, making it hard for me to concentrate at times. After taking RELIEF for a couple of weeks, I can now focus and my mind is much clearer. That’s the Power of X. After a touch illness I became very discerning about what I put in and on my body. Friends had told me about CBD oil a few years ago but I ignored them. I’m now past my illness and want to maintain my good health. About 4 months ago I heard about CBD again and I started doing research and reading reviews. I heard about Relief and it’s bioavailabity, something I know about from taking supplements, I thought it would try it. I’m so happy I did. I reach for each morning as I run out the door and it keeps me energized, I have less discomfort in my joints, less sore muscles after my work out. I just feel good. Now my husband and daughter take it. Relief is the perfect name because that’s what we have been given. I had tried 3 others and didn’t want to try any more but my friend’s testimony gave me hope. I’m so glad I was introduced to Relief now for countless reasons! Love it! This product helped me recover from sinus surgery and has given me more energy to tackle daily tasks. I highly recommend this product! Over 5 years ago, I was diagnosed with degenerative disc, spinal stenosis, etc, affecting my C6&7, T1, L4&5. The level of pain that I am talking about can keep you up all night. I had to stop / cut back on a lot of my activities. It even began affecting my travel…I COULD NOT HAVE THAT! 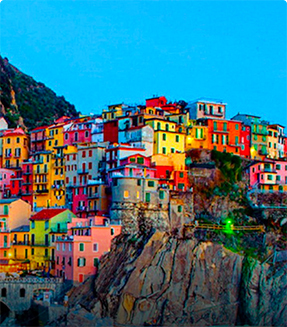 Travel is my passion!!! Managing that level of pain was unbearable at times though, I even took Oxy for awhile! Drs told me that I DEFINITELY needed surgery! But since my husband and I started taking Relief, I have started speed walking again, doing my core exercises, strength training at the gym and sleeping better than I have in years!!! Surgery free and feeling better than I have in a long time! Highly recommend it!!! I’ve been having issues with aches and pains. The most debilitating pain was in my left thigh. I couldn’t sit Indian style, bend my leg and could barely climb stairs daily. I’ve been taking Relief for just under two weeks and not only can I run up the steps, sit Indian style, I’ve also been getting AMAZING sleep. After taking Relief my ability to focus is off the chart, also after running on a daily basis having lots of stiffness and being sore, I fill great. I suffer from 9 different surgeries and two injuries that I will not allow a surgeon to fix. This product has really taken me off opioids and pretty much all pain killers. I tried other oils for 6 mo without success. October 2018 I was introduced to this & I’ve had great relief from joint & back pain from inflammation as I used to see the chiropractor 2 x a mo, and I haven’t gone in 4 months! I broke my arm 2 yr ago with permanent disability which pops & aches regularly but now I’m virtually pain free. 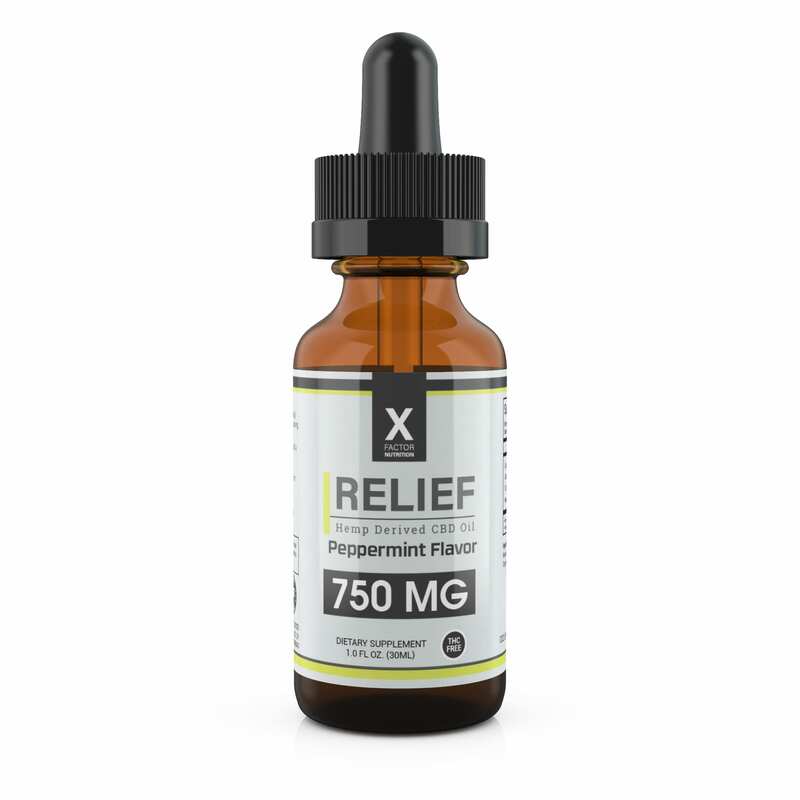 My stomach acid is greatly reduced, my migraines, and overall pain management with this product has enabled me to leave the RX’s behind. 🙌🙌 That’s the power of X ! I recently fell down the stairs and hurt my entire right side from my hip to my knee. I didn’t want to take any pain meds. I’m type 1 diabetic and prefer to go the route where I’m not damaging myself internally. I took Relief and I noticed the pain and my mobility improve the same day! I’m definitely a believer of Relief. Tengo artritis, me ponía una banda elástica en los brazos para aplicar presión y aliviar el dolor un poco. ALIVIO me quitó el dolor de mi artritis, mis nudillos se hinchaban ahora ya no. Las horas que duermo son las mismas pero mi calidad de sueño es mejor. Mi esposo va á cumplir 70 años este año y con la edad viene dolores y falta de sueño. El no ha podido dormir en años y padecía dolor de rodillas. Cuando tomó ALIVIO me dijo que dormío como un bebé y que sus rodillas no le molestaban. Ahora los dos podemos descansar y tener mejor calidad de vida. This product has lowered my blood sugar levels by an average of 80 points!!!!! Can’t say enough about this product. I have used 2 other CBD products and one of them upset my stomach, the other one worked well UNTIL I started to use X-Factor Relief. I will never be without this product. IT is not addictive BUT I will say, I stopped using it for about three days just to see if it was in fact working AND IT DOES, it does work. I have so much metal in my body (more than most cars do) and I hurt everyday all day. Not any more. I do not hurt all day and I do not hurt like I used to. Thank you for this product. The Power of X. Recently, my son was diagnosed with a hip disease that keeps him in a wheelchair. Since I knew it, I suffer from stress, insomnia and back pain. I have to carry him the whole time and he is 6 years old and heavy. I have tried many medications and nothing has worked. I decided to try this oil and it was magical. I sleep well every night, my back pain has been controlled. I am more relaxed and I feel much better. My mood has improved. I do not know if it’s mental or not, but I only know that this oil works and I feel happy for that. Have any questions about this trip? Contact us today!